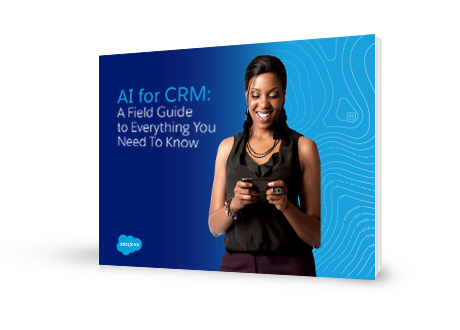 Everything you need to know about AI for CRM. Technology is evolving faster than ever, with an estimated 6 billion connected devices creating an unprecedented network of information and interaction. Artificial intelligence (AI) is the next major wave of innovation, driven by advances in computing power, the ability to store large volumes of data in the cloud at minimal cost, and easier access to advanced algorithms. And it will be more disruptive and powerful than any previous shift in technology. Today, every company must integrate AI into the fabric of their business in order to succeed. Salesforce Einstein, the first comprehensive AI for CRM, is designed to enable companies to be smarter and more predictive about their customers. Are you selling the right product to the right customer at the right time? Are you servicing customers on the right channel by the right agent? Are you marketing on the right channel at the right time with the best content? Are you building apps that leverage the predictive power of AI? Are you ready for a more intelligent future?